You’ll find many Context aware apps in the Android app ecosystem which trigger event when certain conditions meet at the same time. 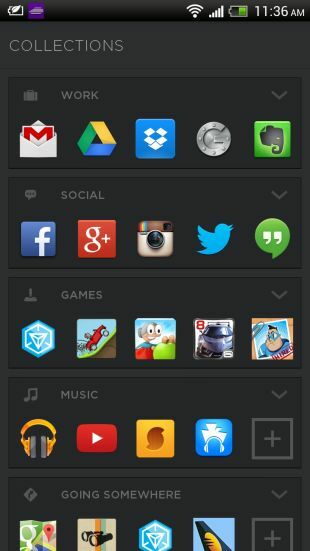 Aviate is an intelligent home screen launcher that organizes your phone around your lifestyle. Aviate automatically categorizes all of your apps according to your needs. Suppose, You’re going for dinner then Aviate will automatically show your photos, tips and reviews for your favorite restaurant. Aviate launcher is not for those users who love to customize their home screen, Users can download Nova launcher to do heavy customization. Aviate is for those who want a simple launcher which brings right apps and information at the right place. How Aviate simply your life? When you wake up, Aviate automatically brings you weather and meetings for the day, yes aviate do this every morning. When you’re driving, Aviate senses your motion from accelerometer and automatically gives you traffic and directions. Aviate automatically brings nearby places, you may want to visit. 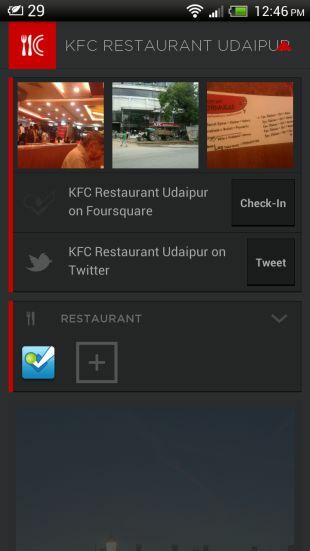 Aviate also shows photos, tips and review from foursquare at the time of check in. Aviate launcher is currently in Alpha version and it requires invite code to work. Users can request invite on getaviate.com, you can also use the apps to sign up for an invite code. Once you successfully authenticate the invite code, the app will take you to the home screen. 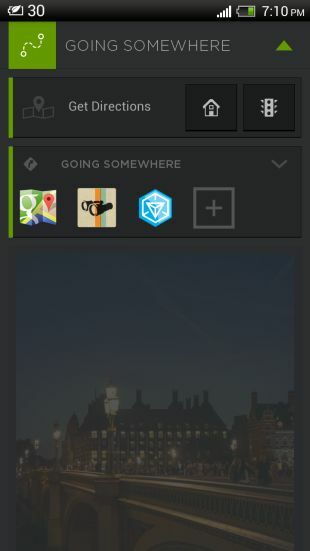 Aviate has only three different screens, First one is your home screen, second one is ‘Collections’ where all the apps club in the different category like Work, Social, Games, Music etc. 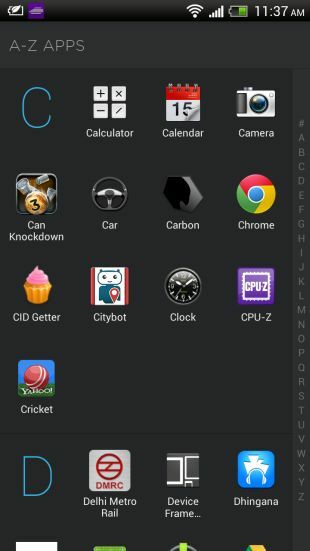 and last screen is ‘A-Z apps’, this is the app drawer where all the apps listed in alphabetical order. You can jump on desired alphabet by tapping on character. The home screen is the heart of the app where all context aware magic happens. At the top you’ll get a bar which changes itself based on the context aware data. Mostly it’ll change into Time, Work, Settings, Going Somewhere and Nearby places. 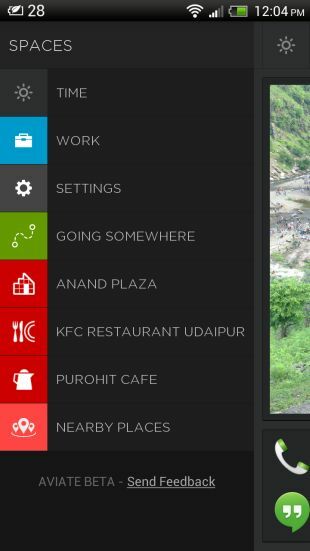 You can also access all these from sliding menu. Simple swipe left from your home screen. Top bar is expandable and show useful information throughout the day. Like in the morning, it’ll show the temperature, today’s event and Morning routine which have apps like Mail, News and weather app. When you’re at work, it’ll show work related apps and next appointments. When you’re at your favorite restaurant, it’ll show photos and check-in button. When you’re driving, it’ll show travel related apps and Get direction button and traffic widget. 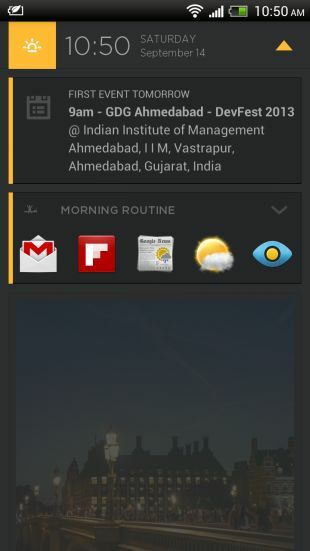 Other than top bar on the homepage, there is a photo frame widget and an app widget by default. You can change the photo or add another widget. Remember the widget will take full width. Aviate launcher comes with two themes light and dark. You can change this from app settings. You’ll surely love this launcher if you’re not in customization game. The app is available free on Google Play Store and requires an Invite code and Android 2.3 or greater. You can download the app from below widget.